This woman just got her revenge on her high school bully. If only we all had the dignity and guts of Louisa Manning. After years of traumatic bullying and teasing at high school, the 22-year-old finally had the chance to stand up to someone who had tormented her. And did she take that chance? Hell yeah, she did. And then she took to Facebook to make sure every bullying victim could find out about it. When Louisa was 12 she was hideously bullied and called names like “manbeast”, “hairy-legs” and “monobrow” by other students. As a result of the bullying, Louisa developed an eating disorder and spent her teenage years with chronically low self-confidence. Those years of pain were something that Louisa remembered when she ran into one of her former bullies at an event. Later he took to Facebook to ask her out. Louisa, who is now a student at Oxford University, came up with a plan to help him understand what he had put her through in high-school. “My gut instinct was to say no,” she told Buzzfeed. So sorry I can’t join you tonight. Remember year 8, when I was fat and you made fun of my weight? No? I do – I spent the following three years eating less than an apple a day. So I’ve decided to skip dinner. Remember the monobrow you mocked? The hairy legs you were disgusted by? Remember how every day for three years, you and your friends called me Manbeast? No perhaps you don’t – or you wouldn’t have seen how I look eight years later and deemed me fuckable enough to treat me like a human being. I thought I’d send you this as a reminder. Next time you think of me, picture that girl in this photo, because she’s the one who just stood you up. 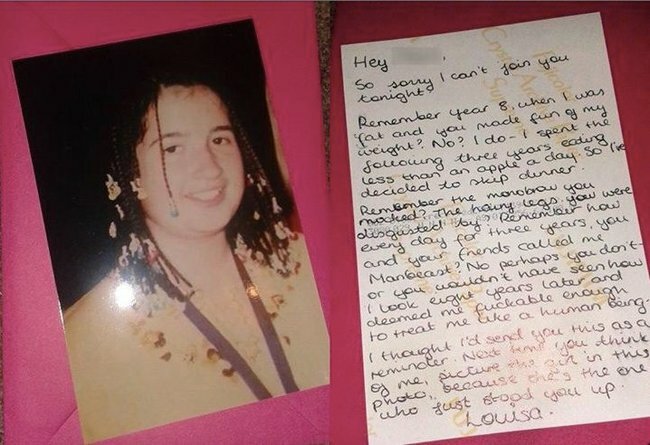 Louisa, who later posted a picture of it to Facebook, was surprised when she received a response from the bully. Hey… For what it’s worth, I was actually here to meet up looking for a chance to meet up looking to make friends, not because you are very good looking. I guess I had it coming though, and certainly don’t blame you for standing me up. While we can agree with Louisa that it was about 10 years too late, perhaps it’s one apology that’s better late than never.